I don’t give away second chances very easily, especially when the offence is severe. That said, I always try to give restaurants second chances, unless the food is so awful that I can’t stomach the thought of torturing my taste buds again. It took me more than 3 years to give the banana leaf rice at Devi’s Corner in Bangsar another try. It wasn’t the food that put me off; but the poor service and their blatant attempt to overcharge me for my food. I met Dev at the Timeout KL Food Awards last year and he persuaded me to give Devi’s Bangsar another try. The banana leaf rice at Devi’s Corner is tastier than the competitor across the road. In my opinion, the competitor’s standard has dropped tremendously since it started 10 years ago and the service is way below par. Unfortunately, the service at Devi’s Corner isn’t that much better. A staff named C.Saravanan was probably the only friendly and attentive guy at Devi’s. He was pleasant and quick on his feet so service from him was prompt. At Devi’s, you get between four to six vegetarian side dishes to go with your rice (RM7) and the curries here are very tasty. I asked for a mix of Kerala fish curry and crab curry – both were thick, richly spiced and slightly creamy from the coconut milk. It’s hard to say which is nicer, so just ask for both. The papadam I got was freshly fried; I crushed and mixed them into my curry-laden rice for a satisfying bite. I liked the mango chutney, but rif thought it didn’t go with the rice. We also shared a portion of mutton masala (RM10) and chicken 65 (RM10). I would have ordered the fried chicken (RM5) but they ran out that night. The chicken 65 was nicely marinated and tender, but portion was scant for the RM10 price tag. I counted only 6 pieces of chopped chicken. The mutton varuval was aggressively spiced and deeply flavoured, but lacked an overall roundness. 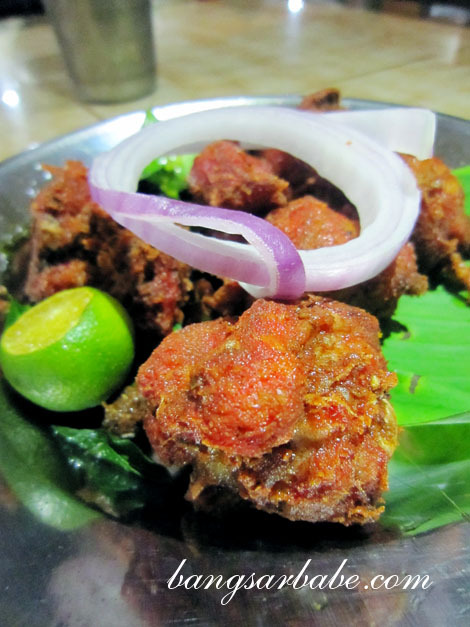 That aside, the mutton pieces were tender and I enjoyed biting into the fatty bits. 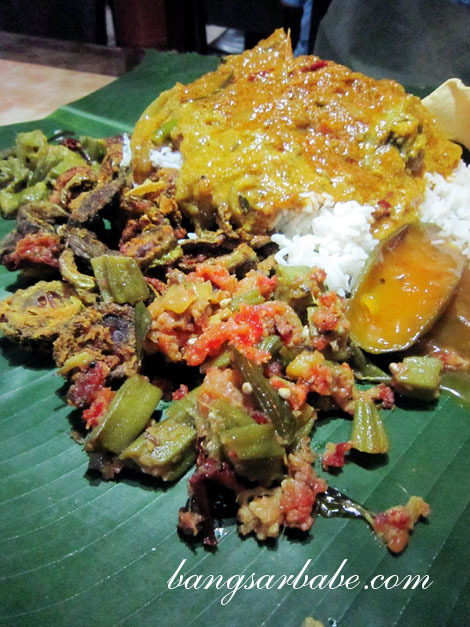 My banana leaf meal at Devi’s Corver was enjoyable, food-wise. Service however, needs more sprucing up – maybe Saravanan should teach his colleagues a thing or two about good working attitude. And I’m happy to report they didn’t overcharge me for anything this time. Verdict: Tasty curries and good side dishes. Hopefully, you will receive better service than a few others and I did. Yikes. Big no-no to MSG. Try the fried chicken next time. That shouldn’t have much MSG, I think. yeah i totally hate it when banana leaf over charge! 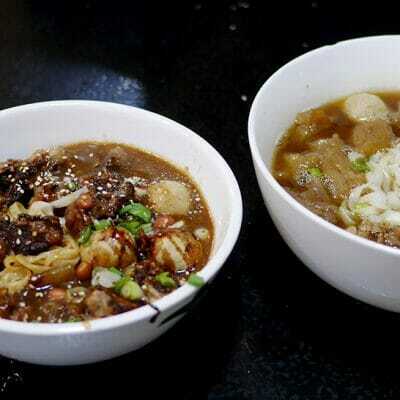 I’ve been to one place before, me and josen eat roughly the same food – but the price is different, every single time! LOL . Yikes! I don’t get why these restaurants charge as they like. So geram! I can totally understand why it takes u 3 years to give Devi’s another try.I gave up Devi’s after my 3rd time there despite the food which I would consider among the best banana leave rice in KL.Each time I went there the service was getting worst.I finally decided not to waste any single cent on such service no matter how good their food is or how near they are to my working place. Far be it from this carrying a racial undertone, please take it from an Indian when it comes to Indian food. We grew up on bona-fide home cooked South Indian delicacies, so commercially popular Indian restaurants like Raju’s, Pandi’s, Nirvana’s, Devi’s etc are just not worth their culinary salt ( pun intended). Venture instead to Indian restaurants that place a greater emphasis on the richness of spices in the curries, varuvals, perratals. Case in point, I just had a fabulous lunch in Acha Curry house in Paramount Garden. I can hear the collective groans of those who had patronised this place before and having been torturously regaled by the stories of the uncle that used to be there. Thankfully it’s a new management and the food is stupendous!! I knew immediately that this was going to be a gastronomic experience when there were an assortment of curries that whetted my appetite. Like a throwback to lunching on my mother’s food, they had crab curry, salted fish curry, onion curry and the staple fish and chicken curry. My buddy and I had a plate of chicken varuval, so richly marinated and spiced it was irresistible. 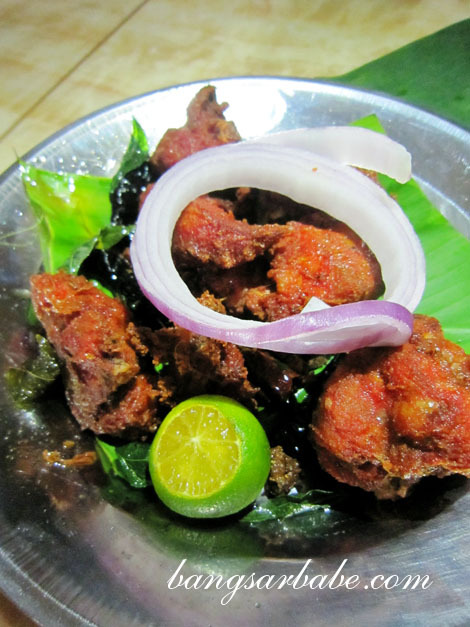 It reminded me of the very famous chicken varuval from the old Kashmir restaurant in SS3. We feasted on the food unabashedly and went for seconds. The guilt of overeating was truly expunged at the end of the sumptuous meal that satiated every fibre in this Indian food afficionado. Word to the wise, the place isn’t super comfortable with just a few chairs and tables thrown about but who bleeding cares. Price was competitive and portions were pretty healthy. Best Indian food I’ve had in a long, long time….. Sorry guys, Acha Curry House is in Petaling Gardens not Paramount Garden as previously stated. Excuse my georaphical faux pax!! It’s the first shop lot at the same row with Kavitha’s, happy dining. other South Indian restaurants in PJ, Brickfields, Jalan Ipoh, Sentul, Lebuh Ampang and Masjid India area. The masala used in the curries are authentic and they cook it well and it does not leave a raw taste in the mouth. It has the right thickness and is not runny. This is an important factor in South Indian curries. The fish is fried with the right masala and is also of decent thickness. The Varuvals and Masalas are all well prepared and the masala infuses into the meat. The vegetables are also well prepared and tasty. 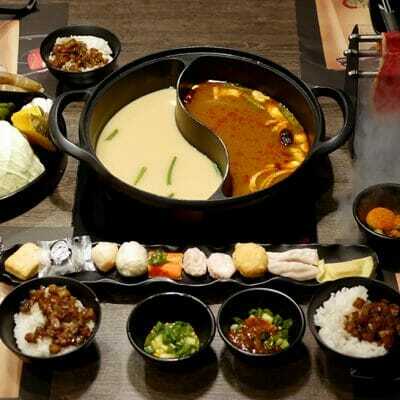 Samabar which is an integral part of the cuisine is really delicious. Kudos to Devi for maintaining the standard. Saravanan and Johnson are exemplary staff.